What is Shrewasia you may be wondering? Shrew, a derivative of Sasha + Drew, not the more commonly used form of shrew, a small rodent, but the “celeb” couple name I gave me and Drew (much to his displeasure). Shrewasia is just Shrew in Southeast Asia. To the dismay of many of our friends, that’s what I’m calling our trip, but don’t worry I didn’t add that obnoxious couple-y hashtag to any of our photos #ily. I’m writing this now from the side of a hotel pool in Can Tho, Vietnam, where we’re trying to escape the 93 degree heat for a quick sec. 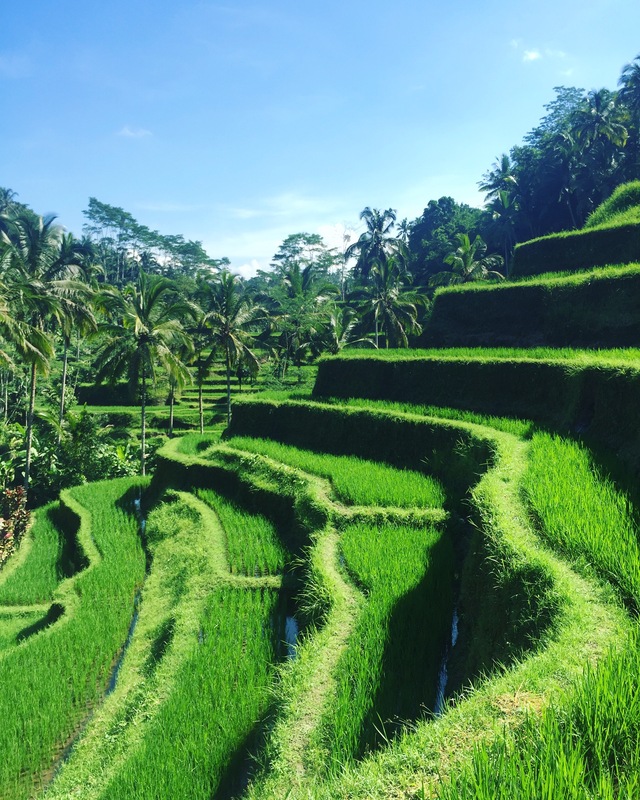 To retrace our steps for a moment, Drew and I started our adventure first in Ubud, Bali, about an hour or so inland from the main airport on the island of Bali. We stayed in a fantastic hotel/Airbnb listing that sort of spoiled us in our first few days. 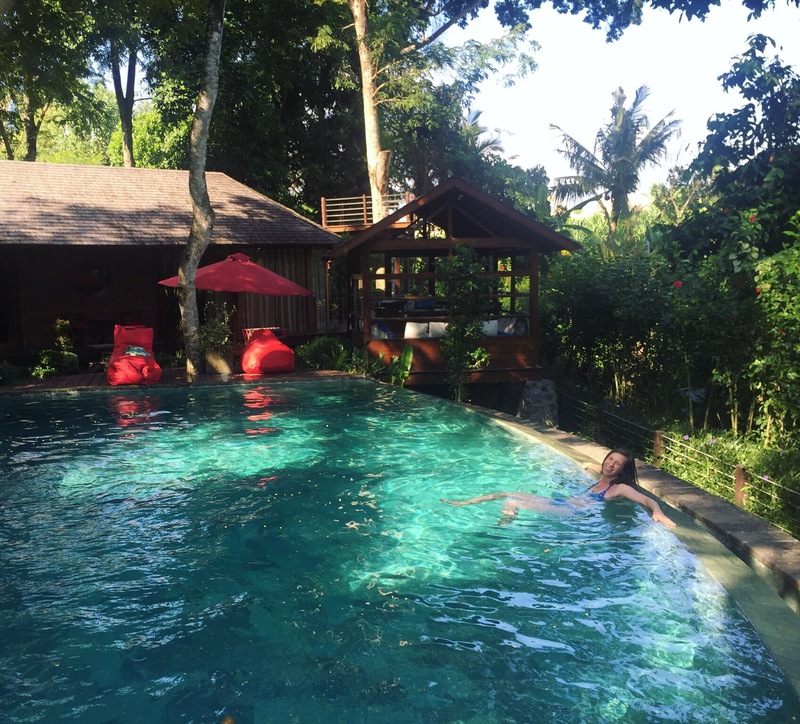 We had free breakfasts (mostly amazing fresh fruit), two pools, and a free shuttle from the hotel into the main town of Ubud since we were about 10 minutes away in a quieter area. We did the typical tourist-y stuff there: visited the monkey forest, nearby temples, and the rice terraces. Still a bit on the tourist-y side, we took a Balinese cooking class recommended to me by Julius, my German friend, that was one of my more favorite things we did on the trip. Our teacher, Puspa, has been running the class for the last 9 years and is an absolute pro at running it smoothly. She also fondly called everyone “honey” and liked to refer to Drew as my “honeybunny.” You can guess that nickname stuck around after the class. Also the food we made was BOMB. 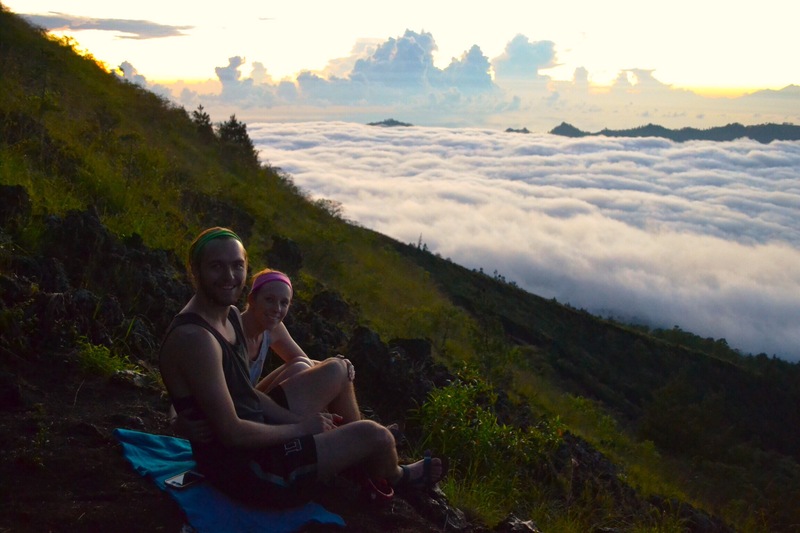 We also decided to do the sunrise trek up Mount Batur. We went to bed at 7:45PM and woke up at the glorious hour of 2:45AM where we took a van with French couple to the base parking lot and met our guide who took us (slowly) to the top. I was mildly dying the whole time so Drew and I went suuuuper slow and made it just in time for sunrise. It was worth it though. After Ubud we went to Canggu, a little north of the main tourist spot, Kuta. There we stayed in my favorite Airbnb I’ve ever been in. Our room overlooked the rice fields, had a little treehouse, and a gorgeous pool. The guest house was separate from the main house and even came with it’s own cat! We (stupidly) thought it would be a good idea to rent a scooter (it costs about $4/day) to see the island instead of take taxis around but that ended up being a huge disaster. Drew took it out for a practice spin and basically didn’t make it out of our driveway – he drove straight into the ditch across the street and 4 Balinese strangers had to help lift the scooter out. It cost us about $47 in damage and we ended up taking taxis anyways. Overall Bali was different than we thought. While it’s beautiful and lush and the people are so welcoming, it’s also quite busy and not as tranquil as I imagined. The island is completely inundated with tourists and expats now, so you can’t go far without seeing tons of white people. If I ever go back I want to explore the more untouched parts of Bali. From Bali, Drew and I flew to Ho Chi Minh city for a night. I had the joy of experiencing (for the 2nd time in my life) some traveler’s diarrhea in the airport which was a real blast. 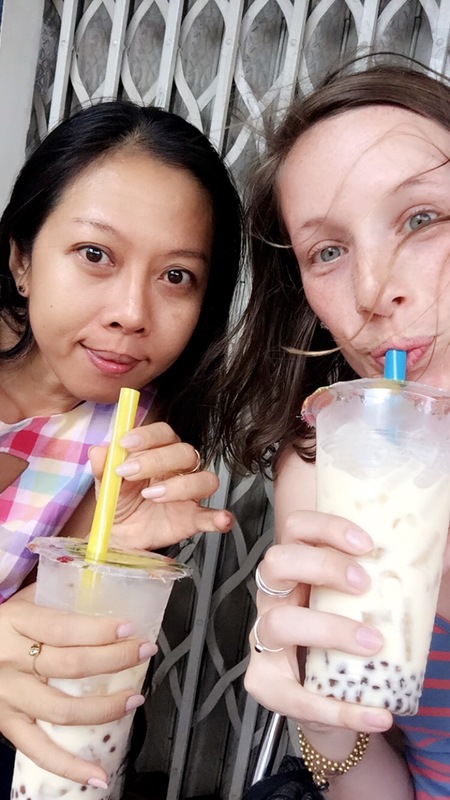 We made it to Saigon in mostly one piece and returned back to the listing Shonna and I stayed in 2014. Our host there, Linh, is hilarious and loves to hang out and improve her English so I asked her if she’d take us to get breakfast at the market in the morning. The next morning Drew and I had to take the bus from Saigon to Can Tho, the smaller town a few hours away where Taylor lives. After buying our tickets at the bus station the people sort of motioned to us so we packed into this teeny tiny van with about 15 other people about to prepare for the 4 hour drive. I thought to myself, “Alright, this is Vietnam. Gotta do it” and tried to get comfortable for the ride. About 5 minutes later they stopped the van and everyone got out and piled into another bus. There we had a bit more legroom and I was thinking, “Okay, this is better. I can handle this” until we were on that bus for a total of 5 more minutes and the same thing happened. This time we got onto a sleeper bus and I knew that was the final move. The ride ended up being only 3 hours and it wasn’t all that unpleasant! Can Tho has been really lovely. My obvious reunion with Tay after 8 months of separation (the longest we’ve gone without seeing each other since their move to Paris when I was 7), riding around on scooters, eating at all her favorite spots, and getting my nails done for $6. Can Tho is pretty small in comparison to Saigon, but still the population is over 1 million. Insane. I’m missing Passover at home this year, the first in my 24 years of life, but I’m lucky I got to celebrate Taylor’s last few days in her new home, meeting all her wonderful friends she’s become close to the past 8 months. Now she and I venture off to Myanmar for a week, where I’m surely going to melt, so wish us luck!